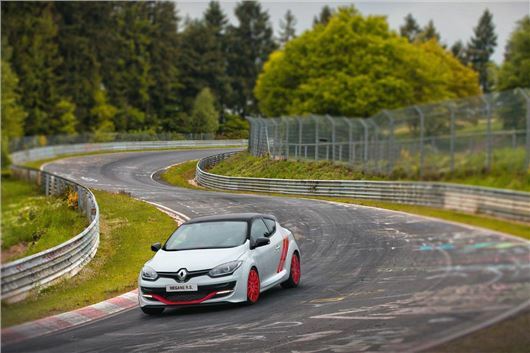 A Megane RenaultSport 275 Trophy-R has retaken the lap record of the Nurburgring Nordschleife for a front wheel drive production car with a time of 7 minutes and 54.36 seconds. This beats a time of 7 minutes 58.4 seconds set by a SEAT Leon Cupra 280 in March 2014. The recently unveiled Mégane Renaultsport 275 Trophy features the Renaultsport 2.0T engine upgraded to 275 hp and the Cup chassis. The more radical Mégane Renaultsport 275 Trophy-R is designed for track driving enthusiasts. Almost 100 kg lighter, the 275 Trophy-R has a chassis fitted with Öhlins Road &Track adjustable dampers and Michelin Pilot Sport Cup 2 tyres. The looks of Mégane Renaultsport 275 Trophy-R are as uncompromising as its technical specification. The two-tone version with Pearlescent White bodywork and a black roof is expected to be particularly popular. New 19’’ Speedline Turini wheels are fitted as standard finished in black with red as an option. The rear wiper has been removed in order to save another precious kilo. This is the first visible sign of the systematic efforts devoted to making the car lighter. On board, the Recaro Pole Position bucket seats illustrate the main purpose of Mégane Renaultsport 275 Trophy-R. These single-piece polycarbonate seats are painted glossy black and upholstered in leather and alcantara. Designed to bring weight savings of 22 kg, they deliver a high level of side support for both the driver and passenger along with “unfiltered” feedback from the track. Alcantara is also present on the steering wheel and hand brake gaiter, whereas leather is used for the gear lever knob. Available as accessories, Sabelt six-point safety harnesses complete the equipment recommended for track driving. Renault Mégane Renaultsport 275 Trophy-R comes with the latest upgrades to the Renaultsport 2.0T engine. Engineers sought to increase torque at peak power of 5,500 rpm by working on the electronic control parameters. By raising torque to 349 Nm (+10 Nm), they boosted engine power to 275 hp (201 kW). Available between 3,000 and 5,000 rpm, maximum torque of 360 Nm remains unchanged. These results can be obtained by selecting Sport or Race modes in Renaultsport Drive dynamic management system. The result of these efforts can be seen in the wider torque curve at higher revs. At the wheel, these developments deliver better acceleration in intermediate gears, for less frequent down shifts. This new engine definition has no impact on fuel consumption or emissions which remain contained at 7.5 l/100 km and 174 g/km of CO2/ . Akrapovic designed a special exhaust system in partnership with Renaultsport. The titanium exhaust, running from the intermediate silencer to the tail, cuts vehicle weight by 4 kg. The carbon tailpipe trim is also by Akrapovic. This assembly gives Mégane Renaultsport 275 Trophy-R a deeper, more raucous sound. Mégane Renaultsport 275 Trophy-R is based on the Cup chassis, which features a mechanical limited slip differential. Designed to improve traction in sports driving, this system delivers dependable efficiency at all times, regardless of grip conditions, driving style or type of curve. The limited slip differential is combined with an independent steering-axis layout, allowing drivers to reap the full benefits of the extra traction for more reassuring handling. The Mégane Renaultsport 275 Trophy-R will make its global public debut at the Festival of Speed on 27th – 29th June being driven up the famous hill by the record setter Laurent Hurgon. For more information, see www.renaultsport.co.uk.